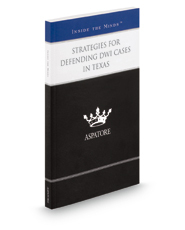 Strategies for Defending DWI Cases in Texas provides an authoritative, insider's perspective on the best practices for mounting an effective defense against DWI charges in Texas. Partners from some of the state's leading criminal defense firms guide the reader through the most successful techniques for defending clients charged with DWI, including investigating law enforcement's administration of standardized field sobriety tests, challenging breath and blood test results, and voir dire. These leaders examine the unique challenges of representing clients facing intoxicated driving charges in this state and offer advice on how best to overcome these obstacles. Covering a range of topics from understanding the various levels of DWI offenses and preparing a client for court to evaluating increasingly complex forensic evidence and deciding when settlement is the best option, these experts describe the strategic process Texas defense attorneys must follow to best serve their clients. The different niches represented and the breadth of perspectives presented enable readers to get inside some of the great legal minds of today, as these experienced lawyers offer up their thoughts around the keys to navigating this complex area of law.